The vertical distribution of temperature is typical of the Subarctic water structure that in summer features a cold subsurface later (a remnant of winter convection) underlain by an intermediate warm layer. This layered structure is especially well defined over deep basins but poorly defined near the Aleutian Islands and nonexistent over the shallow part of the Eastern Bering Sea Shelf with depths <70-80 m. In winter, the ocean's large heat losses to the atmosphere drive thermal convection that causes overturning and mixing of the water column down to 150-200 m depth, sometimes to 250-300 m, so the shelf waters (depth <200 m) become completely vertically mixed. At any time of year the sea surface temperature (SST) in the Bering Sea decreases northward, reflecting the Arctic/Siberian influence. During the coldest months (February-March), the SST ranges from 3°C near the Aleutian Islands to below -1°C over the entire Eastern Bering Sea Shelf. Two isolated areas of extremely low SST (<-1°C) are observed off Koryak Coast and in/off Karaginsky-Olyutorsky Bays. During the warmest month (August), the north-south SST gradient almost vanishes; hence, the same temperatures of 8-10°C are observed across the entire Bering Sea, except for the shallow Bristol Bay, Kuskokwim Bay, Norton Sound, and Karaginsky-Olyutorsky Bays, where the SST exceeds 11°C, and Chirikov Basin (north of St Lawrence Island) with the SST between 5°C and 7°C. In the subsurface layers the maximum temperatures are associated with the relatively warm Pacific waters that enter the Bering Sea mostly via Near Strait. The vertical distribution of salinity reflects surface freshening by river runoff; therefore, salinity increases with depth everywhere and at any time of the year. A small vertical inversion of salinity occurs only during ice formation owing to brine release from the upper layer. The main horizontal gradient of sea surface salinity (SSS) is between the relatively fresh Eastern Bering Sea Shelf waters and the saline waters of the deep Bering Sea. This salinity front exists year round along the shelf break and slope. The off-shelf waters of the deep Bering Sea have a relatively constant SSS through the year that increases from <32.5 to >33.0 toward the Aleutian passes. 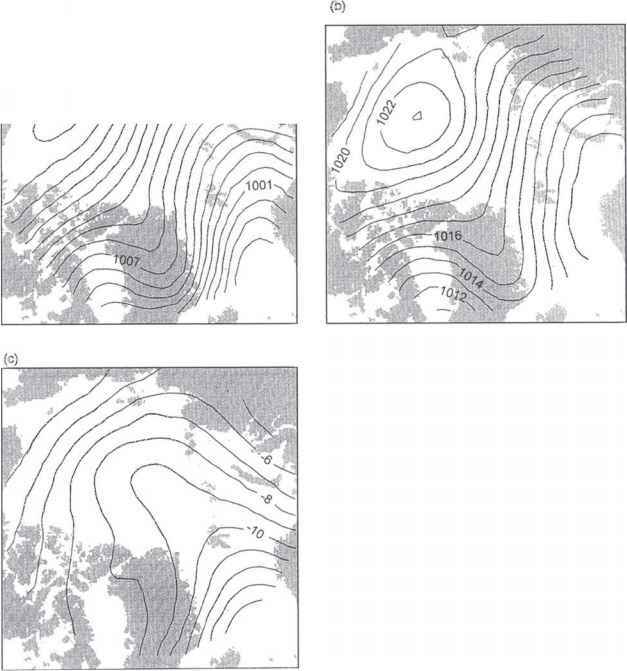 The Eastern Bering Sea Shelf water's SSS changes with season from 32.0 to 32.5 in winter down to <31 in summer. The lowest SSS values are observed in Anadyr Gulf (19-20 in June), Norton Sound (<28-29 in June-September), and Bristol Bay (<29-30 in June-August). The major rivers are Yukon and Kuskokwim that discharge, on an average, 6412 and 1503 m3 s-1, respectively. The maximum peak discharge of Anadyr River is 1780 m3 s-1. In summer (June-September), another salinity front forms along the shelf break off Koryak Coast and Kamchatka Peninsula. Across this front the SSS ranges from <30 over the shelf to >32.5 in the offshore waters.